You can have maximum impact on the issues you care about by giving over time. Human Solutions can count on your support, which helps us plan ahead to deliver the best programming we can. You don't have to decide whether to give every time an ask hits your inbox, because you already made a thoughtful commitment to help people in your community. THANK YOU for becoming a Path Builder. 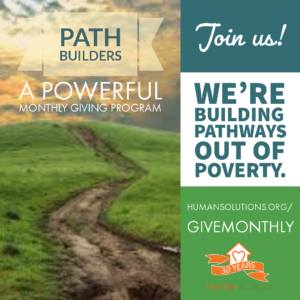 Our work building pathways out of poverty is stronger with you on the team! My partner and I give to Human Solutions monthly because we know even modest gifts will have a really positive impact on the stability of families in our community. Monthly giving is convenient and important!